The mutiny on the Bounty was a mutiny aboard a British Royal Navy ship on April 28, 1789 which has been made famous by several books, films, and other media such as song. The mutiny was led by Fletcher Christian against the captain, William Bligh. Bligh was then cast adrift in a small open boat with 18 loyal men. A typical mutiny in the Royal Navy during the eighteenth century involved sailors simply refusing to obey certain orders until some demand was met, such as the receipt of overdue pay, and they most commonly took place when a ship was in port — essentially, a mutiny was the naval equivalent of a labor strike, and although technically punishable by death, often resulted in no punishment at all. The Spithead and Nore mutinies that took place several years after the Bounty were along the same line, but were larger and better organized. The mutiny on the Bounty, involving no demands from the crew, the seizure of a ship by violence, and setting the captain and loyal crew members adrift, was extremely unusual. The role played by the crew's possible attraction towards the Tahitian lifestyle, Bligh's own heroic survival and the sheer drama of the whole episode has contributed to its continued popularity as a literary cinematography theme. The Mutiny also led to the expansion of the British Empire with the incorporation of the Pitcairn Islands. In the public mind, the suspicion remains that the mutineers may have been justified in their rebellion, despite general recognition that insubordination cannot be tolerated in any military setting. The experiences of the mutineers on Pitcairn, too, became the stuff of legend. It represents a type of imperial narrative in which white men pit themselves against nature to create a new society on a distant, tropical island In this view, the adventures of Fletcher and his companions fit a certain genre of imperialist narrative, that fills “far flung and sometimes unknown spaces, with eccentric or unacceptable human beings, with fortune-enhancing or fantasized activities like emigration, money-making and sexual adventure. Thus, the mutineers created a "new world for themselves," in this instance on a Pacific Island. His Majesty's Armed Vessel (HMAV) Bounty began her career as the collier Bethia, built in 1784 at the Blaydes shipyard near Hull. Later she was purchased by the Royal Navy for £2,600 on May 26, 1787 (JJ Colledge/D Lyon say 23rd May), refitted, and renamed Bounty. She was a relatively small sailing ship at 215 tons, three-masted and full-rigged. Her conversion for the breadfruit expedition mounted only four four pounders (2 kg cannon) and ten swivel guns. By way of comparison to other converted three-mast colliers used for similar expeditions, Cook's Endeavour displaced 368 tons and Resolution 462 tons. The only two men ever to command her as the Bounty were Lieutenant William Bligh and Fletcher Christian, the latter of whom illegally took command through mutiny. Bligh was appointed Commanding Lieutenant of Bounty on August 16, 1787, at the age of 33, after a career that included a tour as sailing master of James Cook's HMS ''Resolution'' during Cook's third voyage (1776-1779). Though commonly portrayed as the epitome of abusive sailing captains, this portrayal has recently come into dispute. Caroline Alexander, in her book The Bounty points out that Bligh was relatively lenient compared with other British naval officers. Bligh received the appointment because he was considered an exceptionally capable naval officer—an evaluation that would prove to be correct. He enjoyed the patronage of Sir Joseph Banks, a wealthy botanist and influential figure in Britain at the time. That, and his experience sailing with Cook and familiarity with navigation in the area and local customs, were probably prime factors in his appointment. The ship had been purchased by the Royal Navy for a single mission in support of an experiment: they were to travel to Tahiti, pick up breadfruit plants, and transport them to the West Indies in hopes that they would grow well there and become a cheap source of food for slaves. The experiment was proposed by Sir Joseph Banks, who recommended Bligh as commander, and was promoted through a prize offered by the Royal Society of Arts. In June 1787, Bounty was refitted at Deptford. The great cabin was converted to house the potted breadfruit plants, and gratings fitted to the upper deck. Her complement was 46 officers and men. On December 23, 1787, Bounty sailed from Spithead for Tahiti. For a full month, Bligh attempted to round Cape Horn, but adverse weather blocked the Bounty. Bligh ordered the ship turned about, and proceeded east, rounding the Cape of Good Hope and crossing the width of the Indian Ocean. During the outward voyage, Bligh demoted the ship's Sailing Master, John Fryer, replacing him with Fletcher Christian, whom he appointed acting Lieutenant. This act seriously damaged the relationship between Bligh and Fryer, and Fryer would later claim Bligh's act was entirely personal. Bounty reached Tahiti on October 26, 1788, after ten months at sea. Bligh and his crew spent five months in Tahiti, then called Otaheite, collecting and preparing a total of 1015 breadfruit plants. Bligh allowed the crew to live ashore and care for the potted breadfruit plants, and they became socialized to the customs and culture of the Tahitians. Many of the seamen and some of the "young gentlemen" had themselves tattooed in native fashion. Master's Mate and Acting Lieutenant Fletcher Christian married Maimiti, a Tahitian woman. Other warrant officers and seamen of the Bounty were also said to have formed "connections" with native women. The Women are handsome … and have sufficient delicacy to make them admired and beloved - The chiefs have taken such a liking to our People that they have rather encouraged their stay among them than otherwise, and even made promises of large possessions. Under these and many other attendant circumstances equally desirable it is therefore now not to be Wondered at … that a Set of Sailors led by Officers and void of connections … should be governed by such powerful inducement … to fix themselves in the midst of plenty in the finest Island in the World where they need not labour, and where the alurements of disipation are more than equal to anything that can be conceived. In the eighteenth century Royal Navy, rank and position onboard ship was defined by a mix of two hierarchies, an official hierarchy of ranks (commissioned officers, warrant officers, petty officers, and seamen) and a conventionally-recognized social divide between gentlemen and non-gentlemen. At the top of the official rank hierarchy were the commissioned officers — on a larger warship, the commissioned officers included the captain, several lieutenants to command watches, and the officers commanding the Royal Marines on board the ship. The Bounty, however, carried no Marines, and no commissioned officers other than Lieutenant Bligh himself, who served as master and commander of the ship. As he was effectively the captain he occupied a private cabin. Next below the commissioned officers came the warrant officers, such as the sailing master, master's mates, surgeon, boatswain, purser, and gunner, who were as likely to be considered skilled tradesmen rather than gentlemen. As the senior warrant officers, the sailing master and his mates were entitled to berth with the lieutenants in the wardroom (though in this case there were no lieutenants there); other warrant officers berthed in the gunroom. Like commissioned officers, warrant officers had the right of access to the quarterdeck and were immune from punishment by flogging. They held their warrants directly from the Navy, and the captain could not alter their rank. Roman Catholics were allowed to serve as warrant officers, but not as commissioned officers. Below the warrant officers came the petty officers, who were technically ratings like the seamen. The petty officers included two separate groups: young gentlemen training to be future commissioned officers, often serving as midshipmen or master's mates, and tradesmen working as skilled assistants to the warrant officers. Although the young gentlemen technically were ratings, holding a rank below warrant officers at the mercy of the captain, as aspiring future commissioned officers they were considered socially superior and were often given a watch (with authority over some warrant officers) or a minor command. Finally, at the bottom of the social tree were the seamen, divided into Able Seamen and Ordinary Seamen. Aboard some vessels, an even lower grade existed called Landsman, who were seamen-in-training with very little or no naval skill. Note, however, that the young gentlemen might also be rated as seamen rather than midshipmen on the ship's books, though they were still considered the social superiors of the seamen, petty officers (excluding other young gentlemen), and most warrant officers, and could be given authority over them. Crew members' biographical information may be found in the Bounty Crew Encyclopedia  page at the Pitcairn Island Study Center site (PISC). In her ill-fated voyage, The Bounty left Tahiti on April 4, 1789. On April 28th, in Tonga (some 1300 miles west of Tahiti), Fletcher Christian led the now famous mutiny. From all accounts, Christian and several of his followers entered Bligh's cabin, which he always left unlocked, awakened him, and pushed him on deck wearing only his nightshirt, where he was guarded by Christian holding a bayonet. When Bligh entreated with Christian to be reasonable, Christian would only reply, "I am in hell, I am in hell!" Despite strong words and threats heard on both sides, the ship was taken bloodlessly and apparently without struggle by any of the loyalists except Bligh himself. Of the 42 men on board aside from Bligh and Christian, 18 joined Christian in mutiny, two were passive, and 22 remained loyal to Bligh. The mutineers ordered Bligh, the ship's master, two midshipmen, the surgeon's mate (Ledward), and the ship's clerk into Bounty's launch. 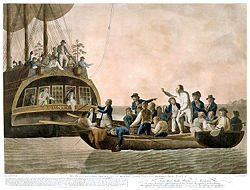 Several more men voluntarily joined Bligh rather than remaining aboard, as they knew that those who remained on board would be considered de facto mutineers under the Articles of War. In all, 18 of the loyal crew were in the launch with Bligh; the other four were forced to stay and man the ship with the mutineers. The mutiny took place about 30 nautical miles (56 km) from Tofua (Bligh spelled it Tofoa). The first island on which Bligh and his loyalists attempted to land was Tofua. They had sought refuge in a cave (which they called "Murderers' Cove") in order to augment their meager provisions. The only casualty during his voyage was a crewman, John Norton, who was stoned to death by the violent natives of Tofua. 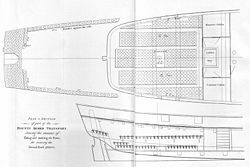 In an remarkable feat of seamanship and navigation, Bligh navigated the overcrowded 23 foot (7 m) open launch on an epic 47-day voyage first to Tofua and then to Timor equipped only with a sextant and a pocket watch, with no charts or compass. He recorded the distance as 3,618 nautical miles (6710 km). He passed through the difficult Torres Strait along the way and landed on June 14. Shortly after the launch reached Timor the cook and botanist passed away. Three other crewmen died in the coming months. Meanwhile, the mutineers sailed for the island of Tubuai, where they tried to settle. After three months of terrorizing the natives, however, they returned to Tahiti to put 16 of the crew ashore. Christian, eight other crewmen, six Tahitian men, and 11 women, one with a baby, set sail in Bounty hoping to elude the Royal Navy. According to a journal kept by one of Christian's followers, the Tahitians were actually kidnapped when Christian set sail without warning them, the purpose of this being to acquire the women. The mutineers passed through the Fiji and Cook Islands, but feared that they would be found there. Moving on, they rediscovered Pitcairn Island, which had been misplaced on the Royal Navy's charts. On January 23, 1790, they burned the ship in what is now Bounty Bay. Some of her remains, such as her ballast stones, are still partially visible in its waters. Her rudder is displayed in the Fiji Museum in Suva. An anchor of the "HMS Bounty" was recovered by Luis Marden in Bounty Bay. 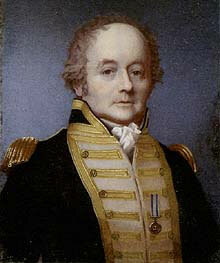 Lieutenant Bligh returned to England and reported the mutiny to the Admiralty on March 15, 1790. HMS Pandora, under the command of Captain Edward Edwards, was dispatched on November 7, 1790 to search for Bounty and the mutineers. Pandora carried twice the normal complement, as it was expected that the extras would man the Bounty when it was recovered from the mutineers. Pandora reached Tahiti on March 23, 1791. Two of the mutineers died in Tahiti between 1789 and 1790 - Matthew Thompson shot Charles Churchill and was therefore stoned to death by Churchill's Tahitian family in an act of vendetta. The four men loyal to Bligh but unable to fit into the launch on April 28, 1789 from the Bounty came on board Pandora soon after its arrival, and ten more were arrested in a few weeks. These 14, mutineers and loyal crew alike, were imprisoned in a makeshift cell on Pandora's deck, which they derisively called "Pandora's Box." Even before Edwards had returned from his search for Bounty,HMS Providence and her tender Assistant began a second voyage to collect breadfruit trees on August 3, 1791. This mission was again championed by Joseph Banks and again commanded by Bligh, now promoted to Captain Bligh. On this second voyage they successfully collected 2,126 breadfruit plants and hundreds of other botanical specimens and delivered them to the West Indies. Unfortunately, the slaves on Jamaica refused to eat the breadfruit, so the main purpose of the expedition was ultimately lost. Departing Tahiti on July 19, 1792, Bligh once again successfully navigated the Torres Strait. On May 8, 1791, Pandora left Tahiti, spending nearly three months visiting islands to the west of Tahiti in search of Bounty and the remaining mutineers, without finding anything except flotsam (including some spars and a yard on Palmerston Island. Heading west through the Torres Strait, Pandora ran aground on a reef (part of the Great Barrier Reef) on August 29, 1791. The ship sank the next day, and 31 of the crew and four of the prisoners (Skinner, Sumner, Stewart and Hillbrandt) were lost. The remaining 89 of the ship's company and ten prisoners (released from their cage at the last moment) assembled in four small launches and sailed for Timor, arriving there on 16 September 1791. After being repatriated to England, the ten prisoners were tried by a naval court. During the trial, great importance was attached to which men had been seen to be holding weapons during the critical moments of the mutiny, as under the Articles of War, failure to act when able to prevent a mutiny was considered no different from being an active mutineer. In the judgment delivered on September 18, 1792, four men whom Bligh had designated as innocent were acquitted. Two were found guilty, but pardoned; one of these was Peter Heywood, who later rose to the rank of captain himself. Another was reprieved due to a legal technicality, and later also received a pardon. The other three men were convicted and hanged. In other trials, both Bligh and Edwards were court-martialled for the loss of their ships (an automatic proceeding under British naval law). Both were acquitted. Bligh resumed his naval career and went on to attain the rank of Vice Admiral. However, his career was marked by another challenge to his authority when he was a Governor of New South Wales; in 1808 the troops of New South Wales arrested Bligh in an incident known as the Rum Rebellion. In 1793, a war broke out on Pitcairn Island between the mutineers and the Tahitian men who sailed with them. Four of the mutineers (John Williams, Isaac Martin, John Mills and William Brown) and Fletcher Christian, were killed by the Tahitians. All six of the Tahitian men were killed during the fighting. William McCoy died after a drunken fall. Matthew Quintal was killed by John Adams and Ned Young after threatening to kill the whole community. Ned Young died in 1800 of asthma. Of the eleven Tahitian women, two died in falls while gathering eggs from a cliff. When the American sailing ship SS Topaz, commanded by Mayhew Folger, reached Pitcairn Island in 1808, only John Adams, nine women, and some children still lived. Fletcher Christian was survived by Maimiti and their son Thursday October Christian. Rumors persist that Fletcher left the island and made it back to England. In 1825, John Adams was granted amnesty for his mutiny; Pitcairn's capital, Adamstown, is named for him. On November 30, 1838, the Pitcairn Islands (which include the uninhabited islands of Henderson, Ducie, and Oeno) were incorporated into the British Empire. As of 2007, Pitcairn Islands is a British Overseas Territory with a small population of about 50 inhabitants. A website bountygeneology.com lists over ten thousand possible descendants of the crew of the Bounty. Representations of the Mutiny tend to pit a humane Fletcher against a brutal disciplinarian, Bligh, even though his own logs show that he was sparing in his use of punishment. He did, however, remove privileges from the crew, which created resentment. A trilogy of novels (Mutiny on the "Bounty", Men Against the Sea, and Pitcairn's Island), as well as the movies and television shows based on them, relate fictionalized versions of the mutiny. The 1962 movie has Fletcher Christian dying in the fire aboard Bounty. A first movie was made in Australia in 1916. The second movie version was the Australian film In the Wake of the Bounty (1933), starring Errol Flynn as Fletcher Christian. The next movie was Mutiny on the Bounty (1935), which won the Oscar for Best Picture that year. It starred Charles Laughton as Bligh and Clark Gable as Christian. Another Mutiny on the Bounty was released in 1962, starring Trevor Howard as Bligh and Marlon Brando as Christian. This version was considered definitive for at least a generation. A fifth film, The Bounty (1984), starred Anthony Hopkins as William Bligh and Mel Gibson as Fletcher Christian. Of all the films portraying the mutiny, the 1984 version is generally agreed to hold the most historical accuracy. C.S. Lewis's book Prince Caspian features a race of humans allegedly descended from lost survivors of a mutiny in the real (i.e., non-magical) world. While it is never stated in the book itself, it is implied that they are originally from the Bounty. In Star Trek IV: The Voyage Home,', Admiral James T. Kirk and the crew of the late Starship Enterprise decide to return to Earth to face a court martial for having stolen the Enterprise to rescue their friend Captain Spock. They return to earth in a captured Klingon Bird-Of-Prey, which Leonard McCoy re-names HMS Bounty. Val McDermid explores the fate of Fletcher Christian in her novel The Grave Tattoo. Rasputina wrote a song about the fate of the mutineers called Choose Me For A Champion. Luis Marden discovered the remains of the Bounty in January 1957. After spotting a rudder from this ship in a museum on Fiji, he persuaded his editors and writers to let him dive off Pitcairn Island, where the rudder had been found. Despite the warnings of one islander -"Man, you gwen be dead as a hatchet!" —Marden dove for several days in the dangerous swells near the island, and found the remains of the fabled ship. He subsequently met with Marlon Brando to counsel him on his role as Fletcher Christian in the 1962 film Mutiny on the Bounty. Later in life, Marden wore cuff links made of nails from the Bounty. A replica of Bounty in Darling Harbour, Sydney. When the 1935 film was made, sailing vessels were still in wide use: existing vessels were adapted to play Bounty and Pandora. The Royal Navy's Bounty has been reconstructed twice. Film production studio MGM commissioned a replica of Bounty for their 1962 film, named the Bounty II. This vessel was built to the original plans and in the traditional manner in a shipyard in Lunenburg, Nova Scotia. However, all the dimensions were increased by approximately one third to accommodate the large 70 mm cameras used. MGM kept this vessel in service. When Ted Turner bought MGM he used this vessel for entertaining. Eventually MGM donated the vessel to a charity. On August 9, 2007 the Bounty made an unscheduled stop at Derry, Northern Ireland. The ship has just completed a $3m restoration and is making a seven week UK tour prior to embarking on a world tour via South Africa and New Zealand to Pitcairn and Tahiti. The UK tour begins with her arrival at the birthplace of mutiny leader Fletcher Christian in Maryport, Cumbria, at midday on Tuesday 14 August 2007. The ship was about three days ahead of schedule which is why it sought out Derry for a 'quiet' stopover before completing the journey to Maryport. On August 23, 2007 the ship docked in Torquay, Devon. The second reconstruction was built for the 1984 Dino De Laurentiis film The Bounty. That vessel was built of steel, is clad in wood, and has modern conveniences. It is currently located in Darling Harbour, Sydney, Australia, where it serves the tourist excursion market. ↑ Louis Becke, (1855-1913) and Walter Jeffery, (1861-1922) The Mutineer. A Romance of Pitcairn Island Project Gutenberg The Mutineer: A Romance of Pitcairn Island Retrieved October 11, 2007. ↑ .Retrieved April 17, 2008. ↑ Brando's bounty's sailing in. Bristol Evening Post, 6. July 5, 2007. A Voyage to the South Sea by William Bligh, 1792, from Project Gutenberg. Bligh's own account of the mutiny. The Eventful History of the Mutiny and Piratical Seizure of H.M.S. Bounty: Its Cause and Consequences by Sir John Barrow, published in 1831, from Project Gutenberg. History of "Mutiny on the Bounty"
This page was last modified on 1 November 2018, at 16:39.